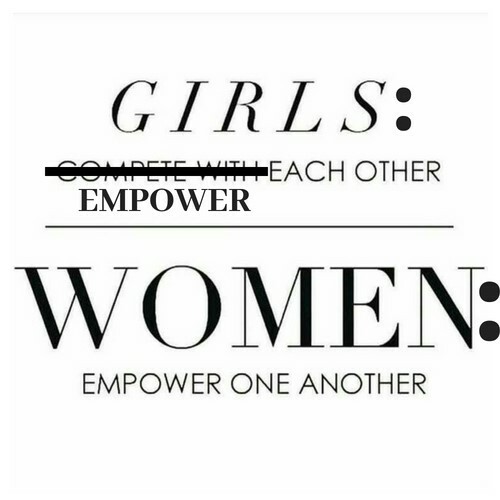 The other day I saw a woman wearing a t-shirt that read: “Girls compete with each other, women empower one another.” As an advocate for empowering women, and a collector of inspiring t-shirts, I was immediately attracted to the quote. However, the more I thought about it, the less I liked it. Eventually, I even became indignant over it. Despite the implication here, ‘girl’ is not a derogative. Therefore, the suggestion that you should be a ‘woman’, and empower other females, not a ‘girl’ and compete with other females is defamatory. Furthermore, this quote creates a gender stereotype that it’s ‘what girls do’, and that it’s socially acceptable, even expected behavior, that girls compete and tear each other down. It further insinuates, that when they do become grown women they should begin to support and empower one another. Most of our behaviors are shaped in early childhood, not adulthood, so why advocate girls competing with each other in their pre-teen and teen years, then expect them to know how to build each other up when they become adults? We should be teaching girls to empower one another from a young age, so that when they become women they already know what it feels like to be empowered by other women, and they know how to empower other women. Teach girls that they don’t need to compete with each other, they are ENOUGH. Teach girls to love and honor themselves, and to support and empower each other. Empowered girls become empowered women.